Cut Out all the Pieces and Help the Caterpillar Come Back Together Again! Count by 5’s. 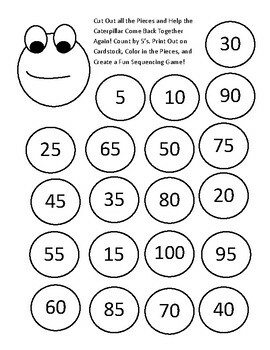 Print Out on Card stock, Color in the Pieces, and Create a Fun Sequencing Game! We have also added Velcro dots to the back of each piece using multiple color card stock to create unique and different caterpillars. Gluing the pieces onto larger circles of various patterned paper or textiles adds a completely unique sensory experience.